Last week on Twitter, our own Demian Farnworth reminded us of a stark, lovely post he’d written about just how hard the life of the writer can be. The piece was called The Year of Falling Apart, and detailed how — even when he’d taken the leap to follow his dreams and live as a writer — he still wasn’t happy. In fact, he was miserable. I thought it would be the year of flying. It was the year I fell apart. I think a lot of us who write for a living have a story something like that one. Writing for a living is a weird thing to do. Maybe not as weird as playing Minecraft on YouTube, or reviewing marijuana for the local newspaper, but it’s still weird. It’s a path not often chosen. So we wind up picking our way through a confusing path — one that’s full of prickles, extremely large rocks, muddy holes with wiggly things swimming in them, and the occasional disgruntled bear. The craft of writing is something we each have to develop as individuals. How to put the words down, one after another, in a way that pleases us … and maybe even pleases an audience. And once we get to that point, we still have a whole new path to uncover. The business of writing — crafting work that has value to others, then getting paid for actually doing it — is tougher for many of us than the putting-words-together part is. My goal in writing this post isn’t to depress you — it’s to remind you that even if your path looks difficult, you are in the right place. It’s worth the time and energy to keep going. The hard part — that whole prickly path business — means that only a few of us follow it through. And the view when you get there is amazing. My second goal is to offer you some company, if you think that would help you. We have a small, passionate group of writers who gather together around a business course that Brian Clark and I created. The course exists to take talented, creative writers (that’s you) and turn you into effective, smart businesspeople and marketers. Some writers think that sounds like a wretched, sad thing to do. This course is not for such writers. Some writers think it would be lovely to pay the bills (perhaps even pay the bills rather handily) while stringing words together. If you are that type of writer, drop your email address in the form below and we’ll let you know when our certification program opens again to new applicants. Want to know more about the Certified Content Marketers program? We open the program to new applicants periodically. Drop your email address in the box below, and, when we’re ready for you, I’ll let you know how to get into the program. I’ll also send you some of my favorite articles about the craft and career of the professional writer. After writers complete our four-week course, they can apply to be on our list of recommended Certified Content Marketers. Each writer's work is carefully reviewed by someone on our editorial team -- I do a good chunk of the reviews myself. If we can vouch for your work -- both the quality of your writing and the solidity of your strategy -- you'll be on our list of recommended writers. This can, as you can imagine, do very nice things for your roster of clients. Not to mention your cash flow. If you'd like to join us, you need to do it before the close of the business day today. At 6:00 p.m. Pacific U.S. time (9:00 p.m. Eastern), we'll be closing the program to new registrants. 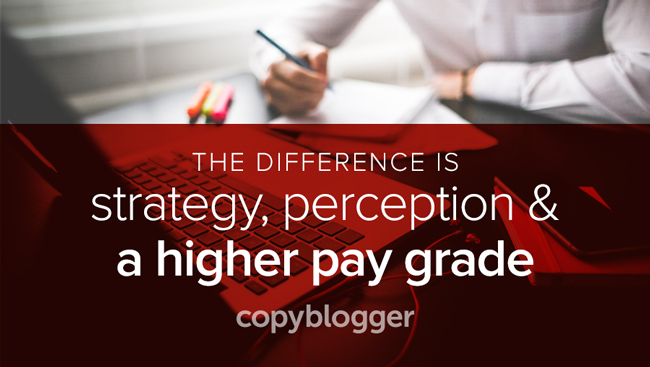 Compared to some of our projects at Copyblogger Media, this program has quite a small (though mighty!) audience. It won't be a good fit for most of the people reading this post. But if it is a good fit for you ... I would love to see you there.